Introducing the campaign tool that not only will make your campaign more efficient, but also allows you and your staff to focus on what is important instead of what is urgent. Whether you're campaigning for your 10th term or your first, every campaign becomes more efficient with the CAMPAIGN INTRANET. Too often campaigns waste our most valuable resource... our time. GOPtools.net developed the CAMPAIGN INTRANET with one thought in mind... reducing the time it takes to create, locate and deliver the vital information your campaign needs. Created to work in conjunction with your campaign's database software, the CAMPAIGN INTRANET uses battle tested tools, archived in a central location, to allow campaigns to become more efficient with their time. They say you can't buy time, but you actually will for less than you think. Only $99.95 a month gets your campaign what took others many years to develop and instantly puts you ahead of your opposition. If you are running your first campaign, the CAMPAIGN INTRANET instantly provides you with campaign tools developed by seasoned political veterans. Easy to understand templates and forms allow your campaign to immediately focus on raising funds and getting your message out instead of developing the framework that every campaign must have to move forward. If you are managing a campaign for an incumbent, there is something for you, too. As you know, campaigns are becoming more mobile. Your candidate is spending most of their time in Washington or your state capitol and you need to communicate complex information. E-mail and fax just can't do it. The CAMPAIGN INTRANET is designed to allow campaigns to instantly track important campaign information from a central, secure, online location. So no matter where you, your candidate, or consultant may be in the world, with an Internet connection, they can securely access your campaign's vital signs instantly. We offer two interactive ways to get to know our product. 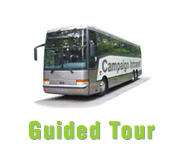 The Guided Tour is the best way to understand the capabilities of the CAMPAIGN INTRANET. 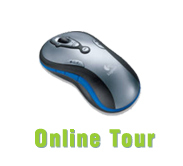 Click on the tour bus, let us know what time works best for your schedule, and we will show you the product that has campaign professionals saying, "Why has this not been created already?" We will send you the needed information that allows you to view the power of the CAMPAIGN INTRANET on your own computer. At a time convenient for you (don't worry, it's not uncommon for us to set consultations well past 6:00 p.m.) a member of our team will guide you through all the benefits of the CAMPAIGN INTRANET. If you prefer to stay in the driver's seat a bit longer, take our Online Tour. Though not as comprehensive as the guided tour, you are sure to see what makes the CAMPAIGN INTRANET such a necessary tool in modern campaigns.